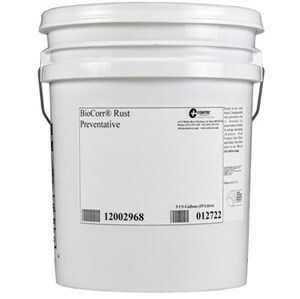 BioCorr Rust Preventative is a waterbased, biobased, and biodegradable rust preventative that is intended for preservation of metals in storage and during transportation. BioCorr Rust Preventative provides multi-metal protection and is an excellent environmentally sound alternative to petroleum derived products. This ready-to-use formulation can provide protection for up to two years of indoor storage, or during shipments when combined with VpCI® packaging materials. Unlike rust preventative oils, this product leaves a dry film on the surface of the metal that is virtually undetectable. This feature helps to create a clean workplace and prevents material waste. BioCorr Rust Preventative is VOC free and the formulation is biodegradable, eliminating expensive disposal costs associated with oils. APPLICATION: BioCorr is a ready-to-use product and can be applied by dipping or spraying. Available in 5 gallon pails (Cortec Product Code 12002968, formerly 15902968) or 55 gallon drums (Cortec Product Code 15902967). 5 gallon pail weighs 50 pounds and ships under our standard shipping rates. The 55 gallon drum must be shipped by truck. We will provide you with a freight quote before we ship this product. This product should be stored sealed in a warehouse to avoid freezing. Agitate before each use. The shelf life of BioCorr Rust Preventative is up to 24 months.